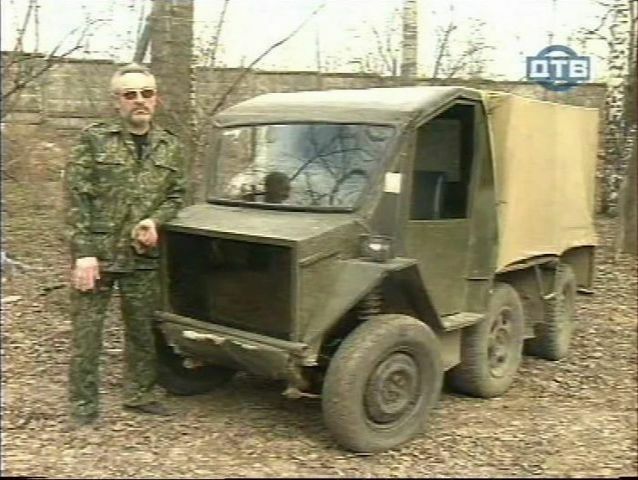 IMCDb.org: Custom Made by Alexander Kopytov in "Kardanny Val, 2008"
"The unique vehicle from the famous inventor Alexander Kopytova. His next off-road vehicle is assembled from parts from a variety of vehicles: the engine of "Oka", the [...] Niva, and the bridge Opel works with parts from Ford. Car body is welded from pipes, the engine used from the "Oka". The car has permanent four-wheel drive through the inter-axle differential. Transmission has eight forward gears and two back. Has a power shaft. Torque to the wheels is transmitted via Shrews from "Oka". From it also borrowed layout devices. Independent suspension all wheels - the original design. Since the "Okatraktor" is intended for use on roads, the suspension used elements from the heavier vehicles: Opel Vectra and Ford Scorpio. The main transmission gearbox borrowed from LuAZ. Provides incredible maneuverability steering gear from Opel Rekord. True, the thrust of it goes not only to the front, but also to the rear wheels. In addition, the gear ratio in 3,7 times more than normal car. Therefore, the machine so sensitive to slight the helm, balloons, like a UFO at an angle close to 90."